Rhubarb in January?! No, I haven’t lost my mind, and I generally try to prepare and write about foods that are in season. But every now and then I get tired of following the unwritten ‘rules’ of food blogging. And since I had a few bags of rhubarb in my freezer just crying out to be made into more of these lovely tartlets, I figured why not? So rhubarb in January it is. Rhubarb freezes remarkably well, so there is no reason you shouldn’t be enjoying it’s unique, tart, splendor any time of the year. I’ve always loved rhubarb. Especially the gorgeous, vibrant, red variety. 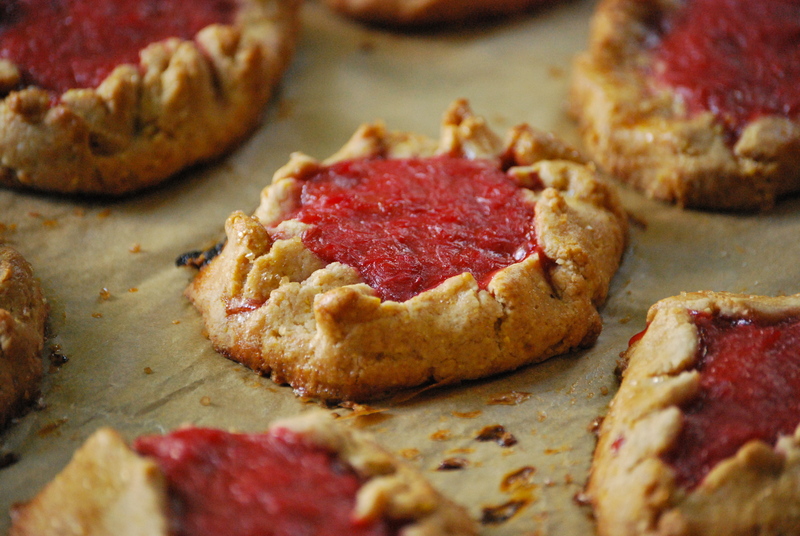 These tartlets are one of my favorite ways to enjoy this sometimes overlooked fruit. Or vegetable. Actually, it turns out rhubarb is a vegetable, but– and I’m not making this up– a court in New York ruled in 1947 that rhubarb is classified as a fruit in the U.S. Anyway… the whole grains in the crust work impeccably well here. One of the best ingredients in this recipe is the addition of the cornmeal. It lends a nice toothsome bite that perfectly contrasts the soft rhubarb compote. Aside from the flavors, I love the size of these tartlets. They’re perfect little individual servings. I’m not sure why, but I’m a sucker for most any miniaturized dessert. There’s something so appealing about them. I also love the rustic, ‘free-form’ look of the crust. They have that homemade quality that just feels…genuine. Like it was made just for you. And since they’re ‘free-form’, there’s no wrong way to shape them. Enjoy! To make the rhubarb compote: Place the rhubarb plus brown sugar in a heavy-bottomed saucepan over medium heat. Stir frequently. 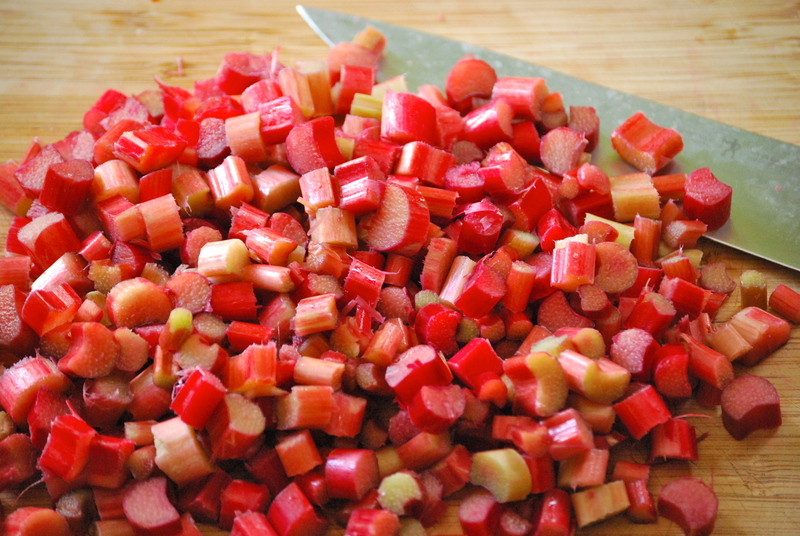 Cook for 10-15 minutes, or until the rhubarb has softened and broken down a bit. Remove from heat and stir in the orange zest. Set aside. Preheat your oven to 375°F. Line a large baking sheet with parchment paper. To make the pastry dough: In a small bowl, mix the egg yolks and cream together. Set aside. Sift the all-purpose flour, whole wheat flour, cornmeal, sugar, and kosher salt together and place into the bowl of a food processor (this recipe can easily be done by hand, too). Next, add the butter and turn the mixer to low. Increase to medium once the butter begins to get incorporated. When the flour is coarse, like cornmeal, add the egg yolks/cream mixture and mix until just combined. The dough will appear crumbly, but will hold it’s shape when squeezed together. This dough is best when shaped right away, as it is really easy to work with. If you need to refrigerate it for some reason, make sure to let it warm up before trying to roll it out. Divide the dough into 10 equal pieces. Lightly flour your work surface and roll each dough ball out to about a 5-inch circle. Use a bench scraper, if your dough begins to stick. Divide the rhubarb compote evenly among the circles — about 1/4 cup each. 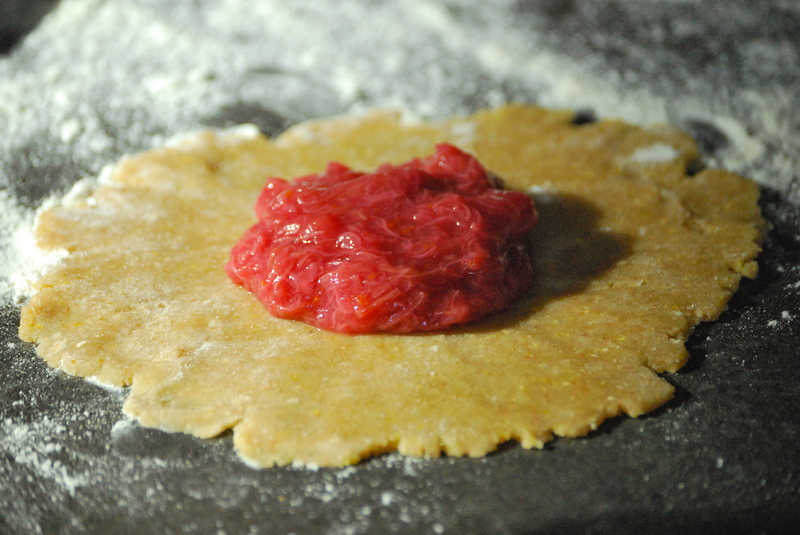 Turn the edges of the dough up and around the compote and pinch the sides together. The dough may split or break, but just keep pinching it together to create a seal. 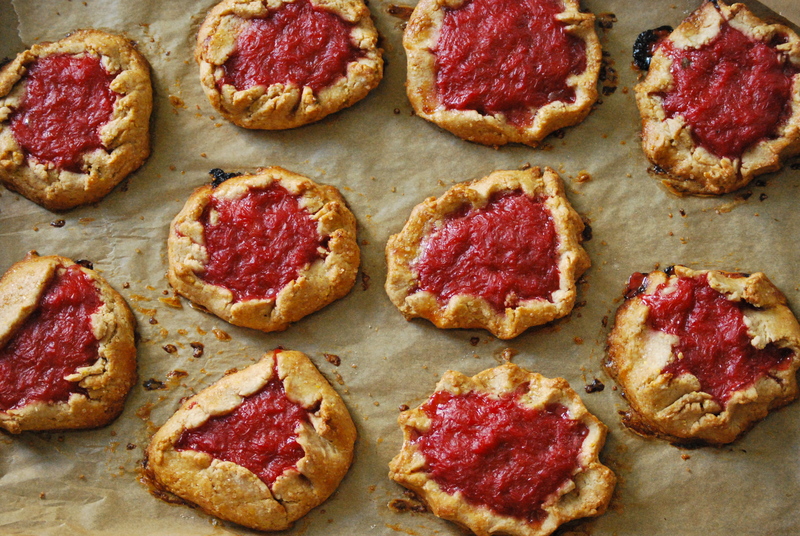 Place the tartlets onto your prepared baking sheet. Use a pastry brush and brush the dough with the egg wash. Bake for about 35 minutes, or until the edges are a beautiful deep golden brown. Remove from oven and cool. These will keep well for days in a sealed container. 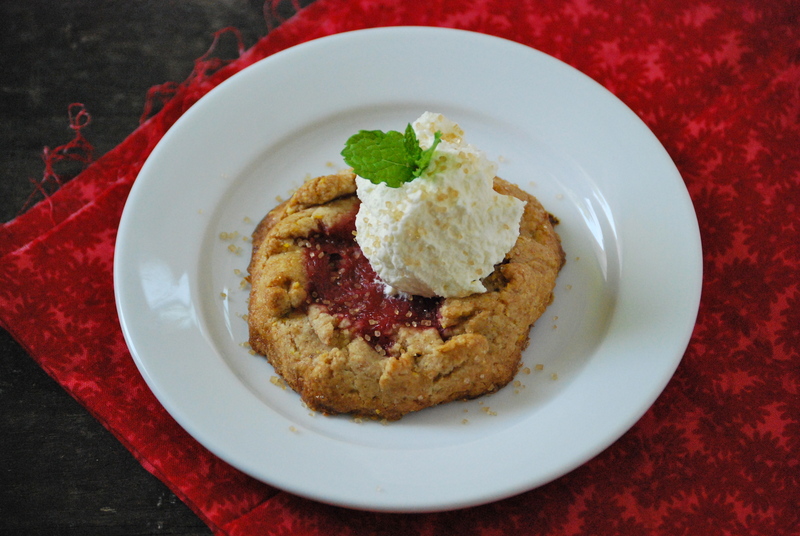 Enjoy with freshly whipped cream and a sprinkle of turbinado sugar! I love have frozen rhubarb – or other summer fruits – on hand. When we get to this gloomy time of year, it makes such a treat! Quite apart from that, we get a crop of rhubarb in the UK in January and this post has made me all the more excited for it! Lovely pictures too. Lucky girl to get fresh rhubarb in January! Thanks, Kathryn! I have a question. I’m not a frequent baker and the few times that I use whole wheat flour with white flour, I use 1/4 of the white flour as the whole wheat amount. Here you are using equal amounts. Isn’t this a very heavy dense dough? The photo of the raw dough rolled out does not look like a 50/50 whole wheat dough. Is it? Hi Stu — thanks for the comment. The dough is 50/50, plus the addition of the cornmeal. So that might make it appear lighter in the photo. The dough is a bit denser than a typical tart dough — which is part of the reason I love it so much. Another option would be to use “white whole wheat flour” instead of the regular whole wheat, if you prefer something less dense. Hope you give it a try! Thank you for your answer about the 50/50 white wheat and whole wheat flours. Yes, I will try it. I like rhubarb very much and grow a nice crop every year. Is it sad that I knew before I even read the second line of the post that this was inspired by Good to the Grain? I guess I’m a bit obsessed with that book. I didn’t know rhubarb froze well. Good to know, not that my freezer has any space. I love that book, too, Sara! You should definitely try freezing rhubarb the next time you have extra. It works great for compotes and crisps. Fantastic! My freezer is bursting… looks like a great way to use up that rhubarb! YUM!!! 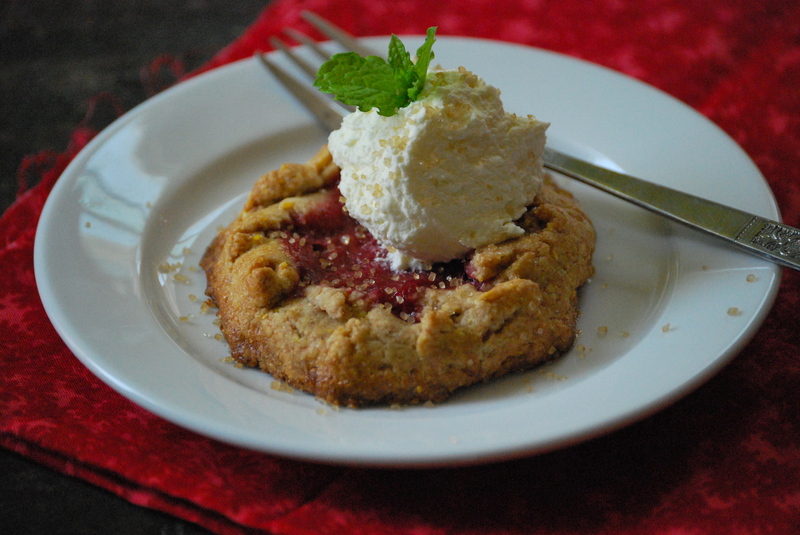 I love rhubarb and am always looking for new ways to use it.